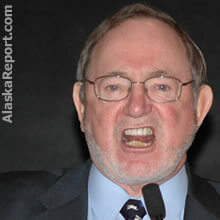 Alaska Congressman Don Young, under multiple criminal investigations for bribery, filed for re-election today at the Office of Elections in Fairbanks, Alaska. "This morning I officially became a candidate for the seat held by Alaska in the U.S. House of Representatives. I hope that this will, once and for all, squash the rumors that I would not and could not run again. "I am running and I am running hard and I am doing it because I love this State and I have loved representing you for the past 35 years. My work is not done for the State of Alaska just yet. Together, we have done great things for Alaska and together we can accomplish so much more. "I know I may come off as gruff sometimes, and some think that my methods in Congress are a bit aggressive. But guess what? I'm effective, and my colleagues in Congress on both sides of the aisle always have acknowledged that. We are a huge state with only one representative in the House. The only way anything can get done for our state is to stand up and fight for it, and I've done that well for you all throughout my career. "We live in a world where liberals from San Francisco are running Congress and their greatest wish is to lock up Alaska and turn it into a national park. Well, that's not happening on my watch, not now and not ever. I have fought long and hard over my career for a state I love and a state I proudly call home. With your support, I look forward to continue standing up for Alaska!"